When the going gets rough, you know it’s time for an easy craft. Cue: felt. And if there’s anything my elementary school education prepared me for, it’s cutting out hearts (and I know that may sound suspect coming from a high school teacher, but I don’t mean that as a diss). It’s downright therapeutic. 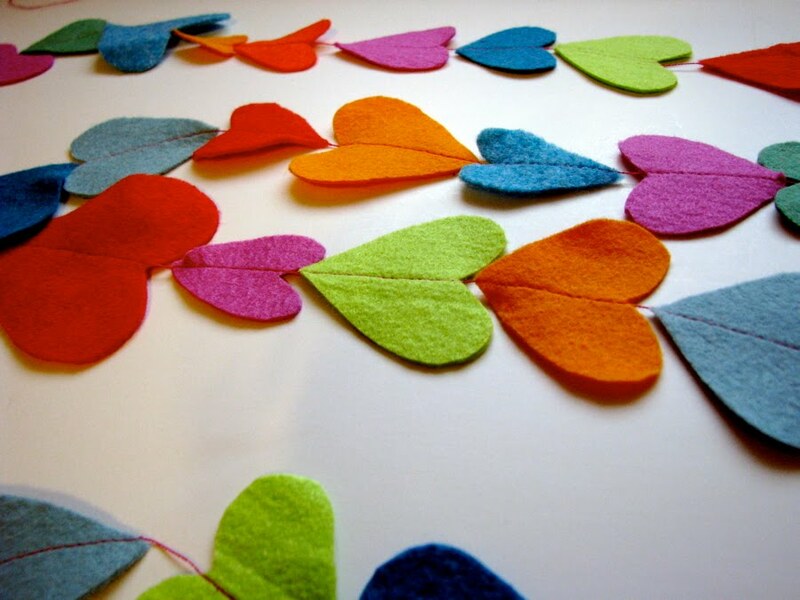 Just fold the felt and go to town with the scissors, machine sew them together in one long string, and voila, heart garland! Construction hint: I thought it would be easier to go pointed side first, but turns out I was wrong. The presser foot does better with the top side of the heart than the point. I had the idea for this after seeing these at Shim + Sons, but I feel this must have been done somewhere else before…maybe Martha (which, now that I have AdBlocker, is much much more enjoyable)? I don’t know. The felt came from Heather Bailey. And I have to also mention: those lovely pieces of lenticular art above the mantel were Mr Rae and my Christmas gifts to eachother last year. They are both from the Science Shows You How series by our friend, Detroit artist Chris Dean. 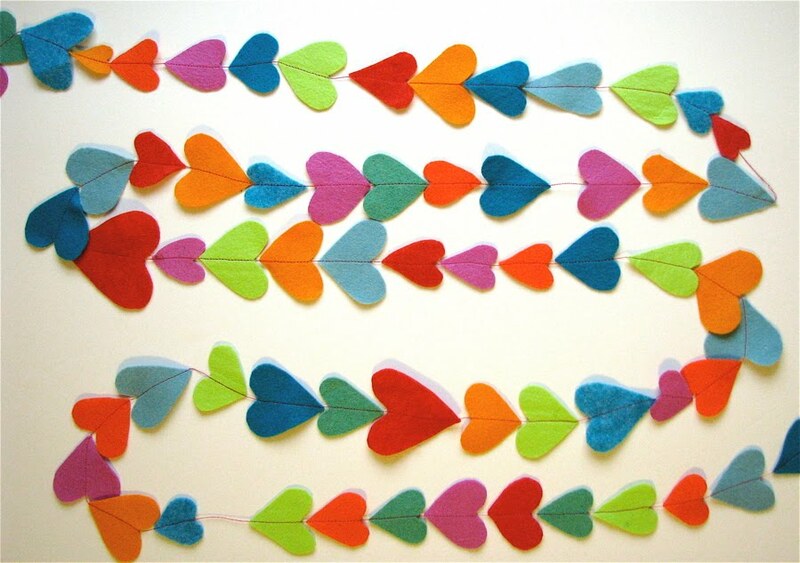 If you’ve made a Valentine’s Day garland, please share! I am so gonna try this!!!! so pretty!!! oooooo this is just plain fun! 🙂 thanks for sharing it. Oh I am SO making this! I'll be sure to share my photos with you when it's done! more felt jealousy here, I might just have to nab me some of that heather bailey felt. I love it on your mantel. Notice our matching candlesticks? Gosh we have good taste, don't we? I also have new bunting in my shop, which might have to make it's way into our decor too! oh – SEW simple 🙂 thanks! That is so super cute!! I want one! love the colors! it's so pretty! your mantel is freaking awesome! I've got to do it! i'm a sucker for anything felt! these are just too cute and they look so easy. i'm thinking maybe of adding fabric on the other side? we have the old fashioned love heart candy rolls at our place, a perfect match for valentine's day! Love the colors- makes for such a sweet mantle-scape (is that a word??) You reminded me of what we did last year! I went with hand stitching so Ernie could help me, and lots of space in between. I used leftover hearts to dangle from the chandelier in the dining room, too- seems like I always have stuff hanging from that light fixture 🙂 I gave mine away last year, I think it's time to make more! These are great! I can't wait to try it out with my daughter. Did it! I am addicted; I want to make more!! ……How many heart garlands is too many? Oh, it's so pretty! And truly simple. Thanks for sharing, Rae! I actually gasped when I saw the first picture. I am LOVING this idea and it is the easiest thing! Thanks. I found you from the Made blog. I love the garland so much that I made one today & posted it on my blog, linking back to you, of course! Thanks for the fun project! Love them. I don't have quite the color stash that you do, but red, cream, white, and burgandy should fit the bill appropriately! Lovely, lovely, lovely! Super cute, I do plan on making something like this! I love this idea Rae! I had to make it right away! Thanks so much for sharing! 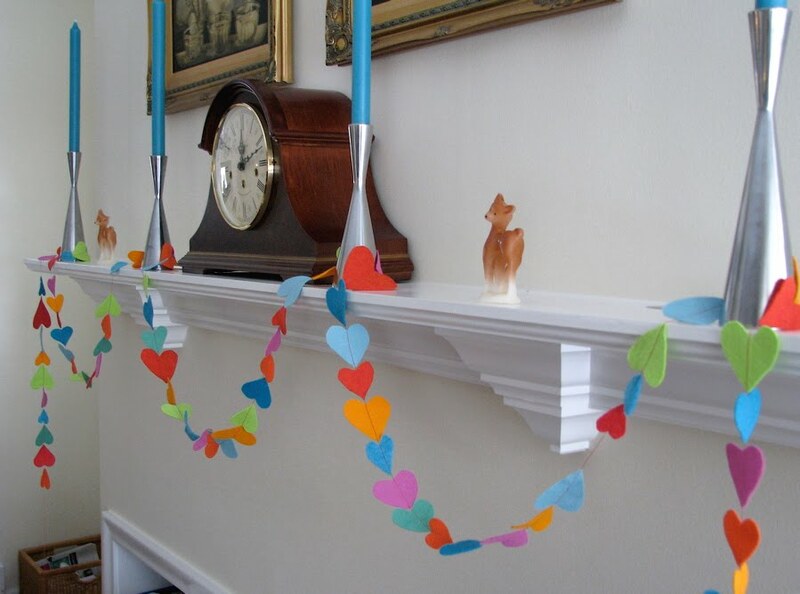 What a fun, fast, adorable garland! Finished! Only, I used paper. I have more scraps of that! what a fun, springy idea. i'm in the middle of making my first ever quilt and this little craft might be a good distraction from all of the geometry brain confusion right now… thanks for the idea! This is adorable! I definitely want to try this. oh.oh.oh. i shall make one or two of these! 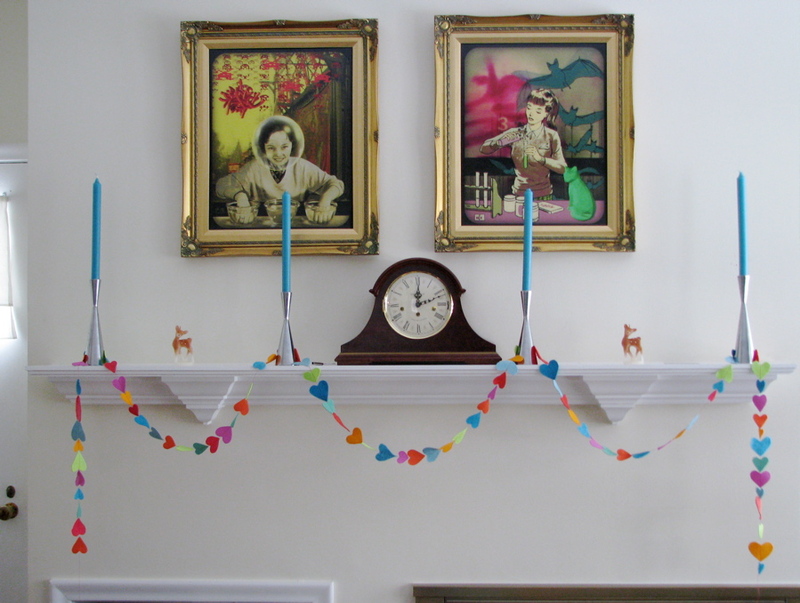 I love this garland–and I have everything to make it!! I absolutely love this. never even considered sewing down the middle!!! Great idea. I love the garland…i have been seeing these everyone, and i def need to make some….. Thanks for the great idea!!! I tried it out and am now kinda obsessed with them!! How fun would these be for different holidays! My four year old and I just made your adorable garland this afternoon. I think I made the hearts a bit big, and may attempt another with smaller ones. But regardless I love the simplicity of this festive decor. I found a felt "LOVE" to add to it as well. I love this idea! I went home right after I read it and made one! Thanks so much for the tutorial and idea! I reached your blog via Balancing Everything. Lovely garland. I will try it! Here is our valentine's garland. this is absolutely precious. i'll be doing this one tomorrow most likely. 🙂 for some reason, this year i'm feeling like all of February should be spruced up like the other winter holidays. Yay! I loved it, had to make it, and invited over some friends to join! Thanks for the inspiration for a fun craft-it-up night! OMG! I have to give this a try.What a great beginner's project for my daughter to do! anyone wanna make one for me? no sewing machine & i've looked everywhere for one. love the colors shown here….we have boys around here so it's nice to have some variation on colors. I made one! Blogged here! Here's mine. Thanks for a fast and fun decoration. thanks for the great idea! it was fun. I made this, but I just used cheap felt and I think it would be better with the good stuff. I just used what I had. Next time I will try and leave a little more space mine bunched together. It is super cute though! I also cant wait for the boy month. I have one little boy and I am so excited! Looking forward to "Celebrate the Boy" in February! Thanks for sharing! You inspired me to try a little twist on it with my kids. My blog is alemonsqueezyhome.blogspot.com. I love your blog! omg – just made 2 of these! one with more pinks for my daughter, and one with more boyish tones for my little man. super easy! I made 3 this morning. Thanks for the great idea! I have posted it on my blog here http://madebyrae.blogspot.com/2010/01/easiest-heart-garland-evar.html hope that is ok?? So cute! I must have it. I'm going to have to go to one of the three storage places we are storing all our crap whilst we do a remodel and find my sewing machine. Thought I could do without it for a few months, saw your heart garland, and realized I couldn't. I'll send you a picture when I'm done. I love this and I love how mine turned out! Perfect for my little guys first Valentine's Day. Totally cute and so easy! This will be a perfect way to occupy my croupy daughter tomorrow. Thanks for the idea. I made one to keep busy while my husband was out of town since I can't sleep when he is gone. I loved this idea so much. I didn't have any nice felt lying around but was able to make something similar using craft foam. Thanks! Super duper cute. And so easy! Now I just need a mantle! Way cute, and I don't even like hearts in general. I just made a red heart garland from a thrifted 29 cent cashmere sweater. The hearts are a little floppy, but I still love it! i love it! such an easy and colorful way to brighten up a room. love love love! going to create it now! so in love with your blog!! And this is fabulous! Made mine last night! I made one a few days ago after the initial posting. Instead of draping it around something, I hung it from a lampshade (no enough felt for a long garland). The movement of the felt hearts make it a beautiful piece above my table. . . I made one! Thanks for the darling idea. This is SOO easy and fun!!! Not only is this too cute but you could translate it into any seasonal motif cut out. Love it! This garland is precious! Just posted in a garland round-up on Craft Gossip! Happy Valentine’s Day!! What type of thread did people use for the felt garland?